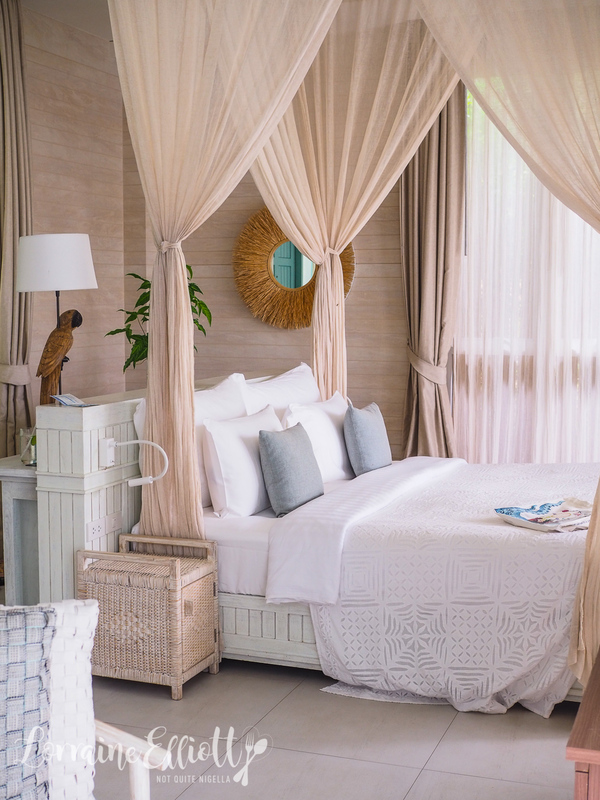 Like stepping back in time, the sleepy, rustic, friendly island of Koi Yao Noi, half an hour from the bustling city of Phuket seems from another time. Rush hour is passing half a dozen motorbikes and the main road is barely wide enough for two cars to pass each other. There's a sleepy mellowness to this fascinating island that seems to be resisting development as much as it can. But that doesn't mean that they aren't welcoming of visitors. 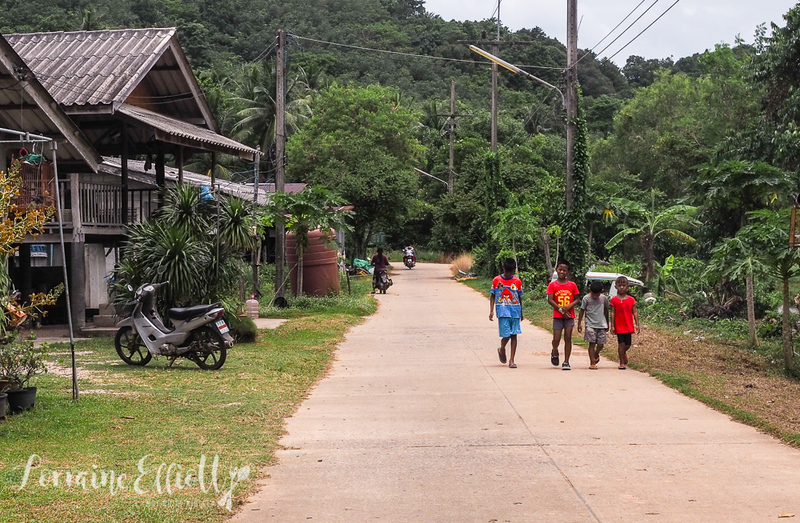 Some say that the friendliest people in all of Thailand are found on Koh Yao Noi and I'm inclined to agree. It's amazing how much things can change just in a 30 minute speed boat ride. 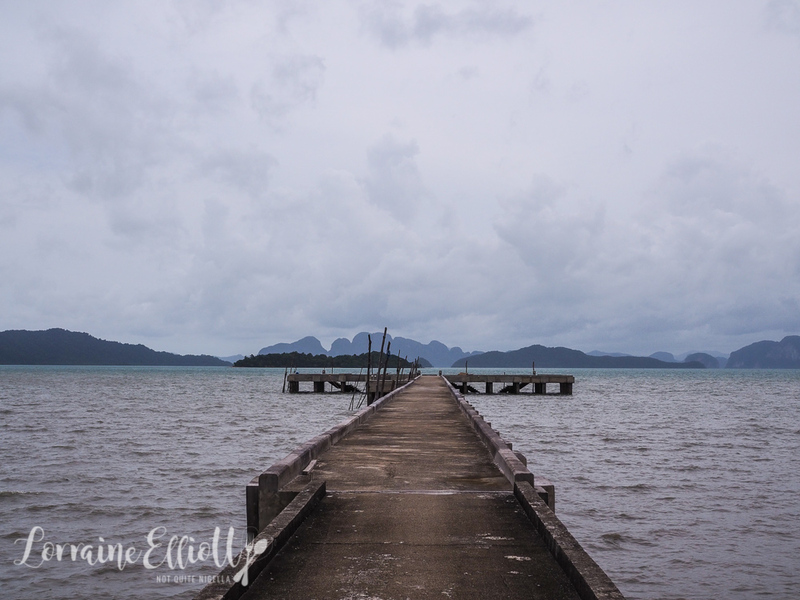 Koh Yao Noi literally means "island long small" (it's sister island Koh Yao Yai means island long big). 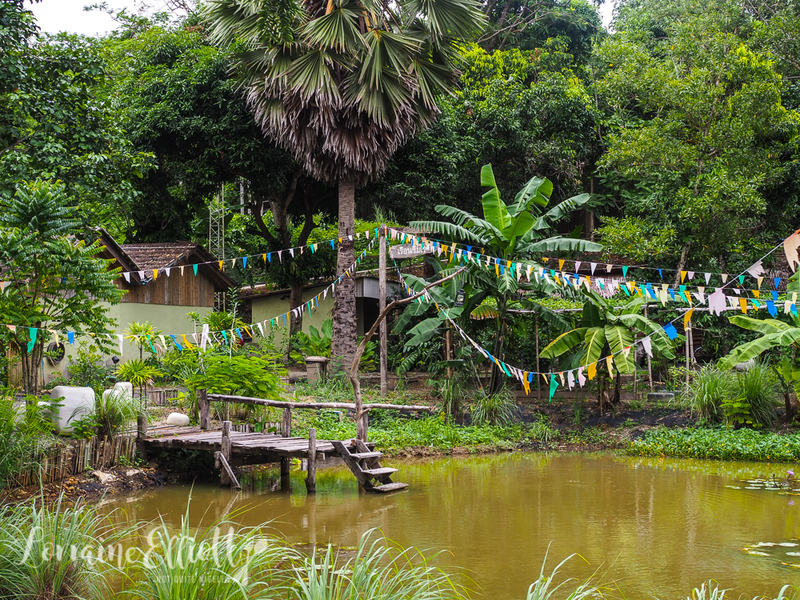 Koh Yai Noi's mostly Muslim population make their living through the sea, agriculture (rubber, rice and coconuts) and eco tourism. We are greeted at the pier by a staff member of Cape Kudu, the island's latest hotel development. 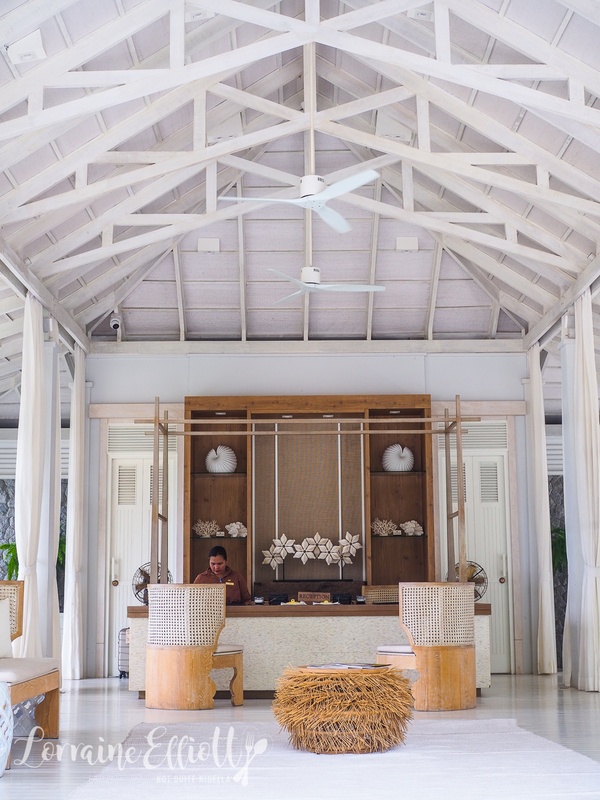 The government has tried to keep hotel development limited to preserve the island's unique culture. I can't help but extend an outstretched hand to feel the breeze and I crane my neck to see the views from the open vehicle. 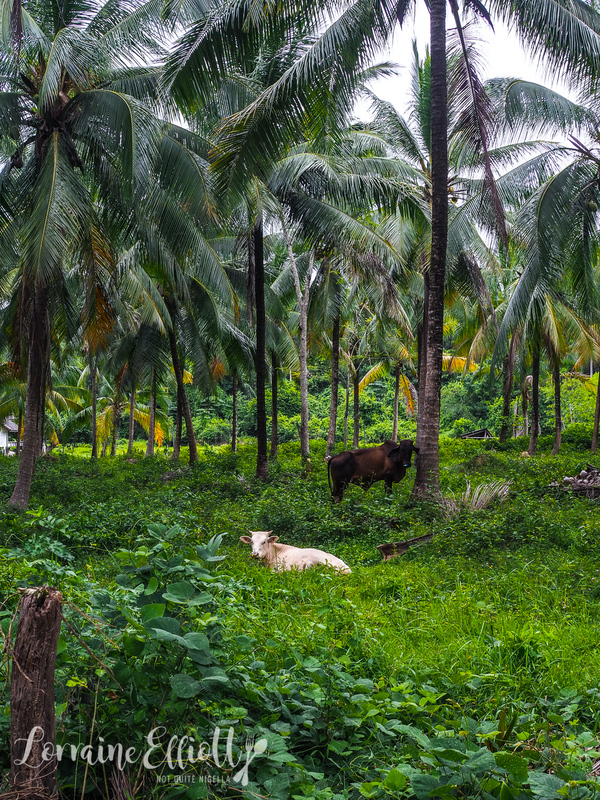 All I can see are simple homes, a lush jungle setting and the occasional person. Navigating around the 30km island is easy as one road circles the island. 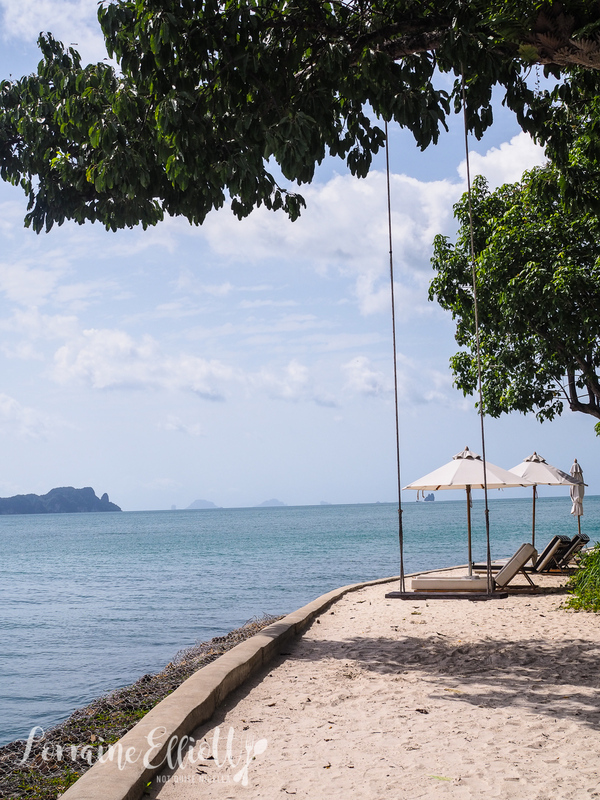 We pass the beach where there are massages offered on open air beds laid with colourful cloth. Big news was the island getting a 7/11. Our driver turns left into Cape Kudu. 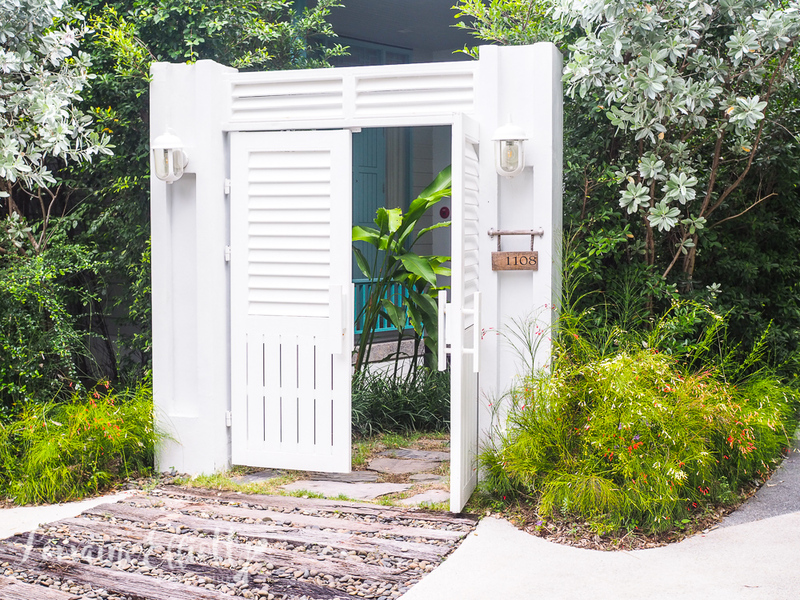 Open for 1.5 years it is a stunning resort beautifully decorated in seafoam blue and whites. Welcome drinks are proffered along with cold towels and I dab at my décolletage with it trying to undo the seasickness from the speedboat ride. We are offered a seat with ocean views while we check in and my nose twitches. I smell...cookies? 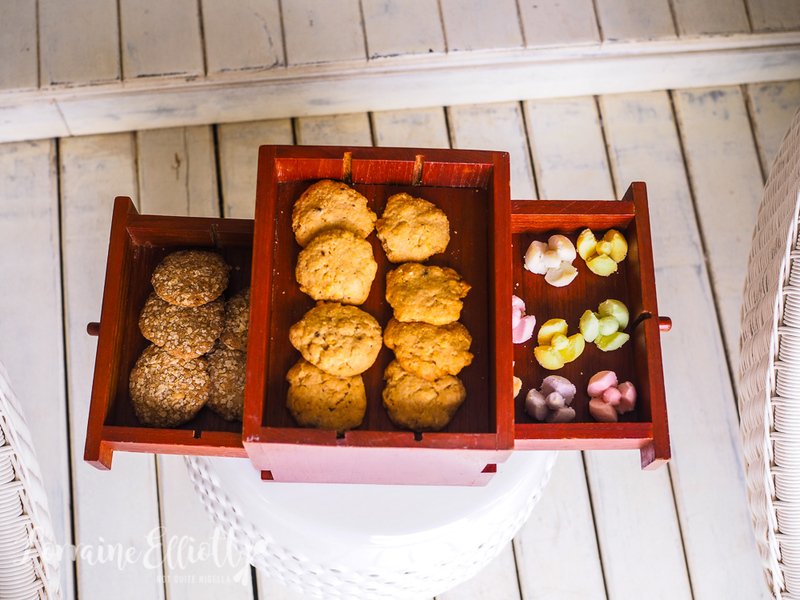 Yes there are three types of freshly baked cookies on offer during check-in. I'm tempted, sorely so, but having eaten a substantial breakfast, I mentally note that come 3pm I shall come creeping back, quiet as a mouse, and slip some on a plate to nibble on. We are shown to our room. 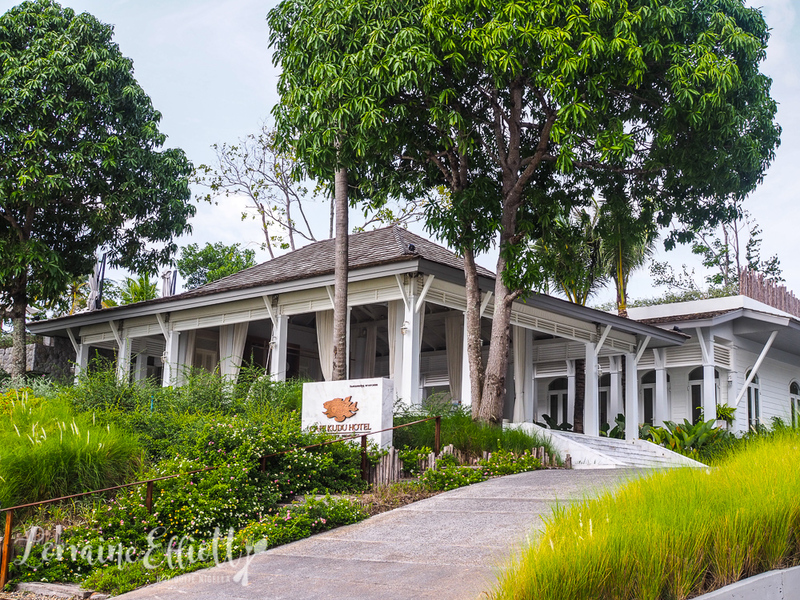 There are 50 rooms and Cape Kudu is part of the Small Luxury Hotels collection along with Hua Hin's Cape Nidra. 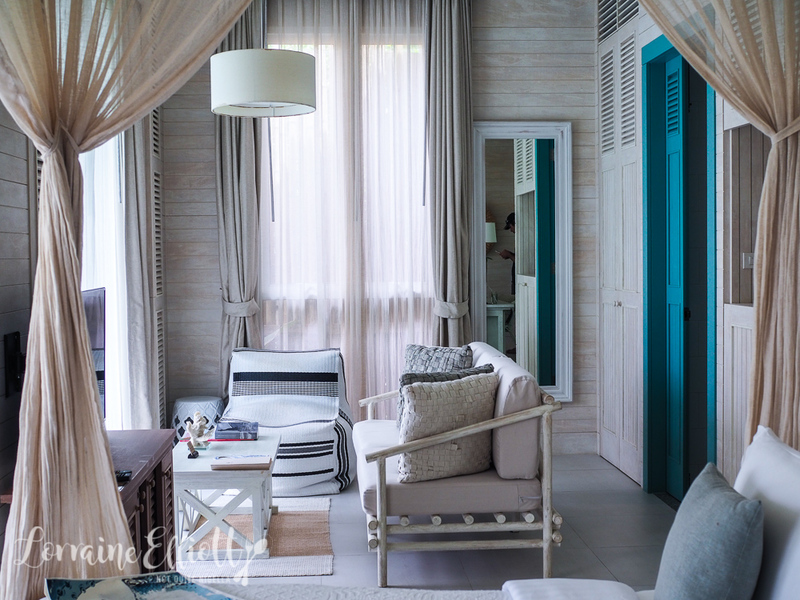 Our room #1108 is a pool villa, a private sanctuary from the popular main pool and it is decorated in the resort's signature blues and whites. It's as soothing for the eyes as it is for the soul. There's a work desk area with speaker, mirror and phone. Behind this is the very comfortable king bed. There is a large, thick pillow as well as a smaller one and I order some pillows from the pillow menu. 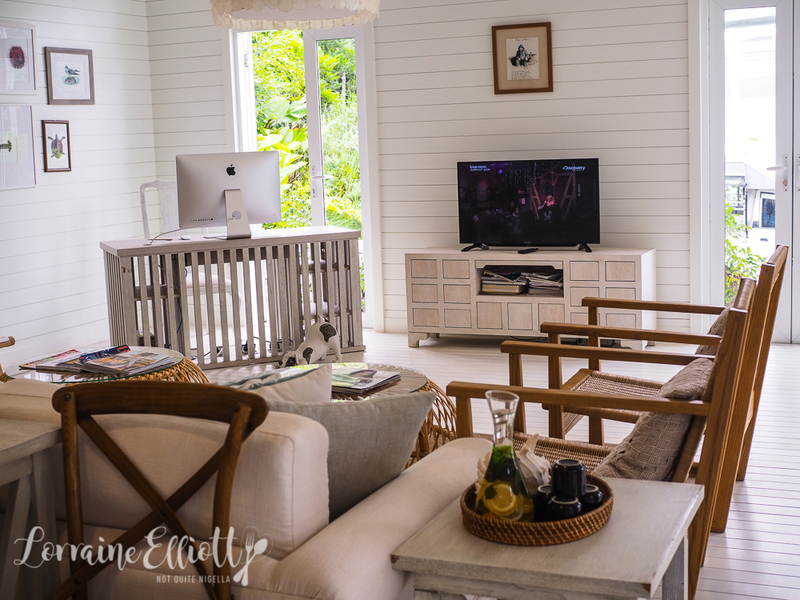 To the right is the lounge area with a comfortable sofa, side chair and television. The mini bar is behind this. 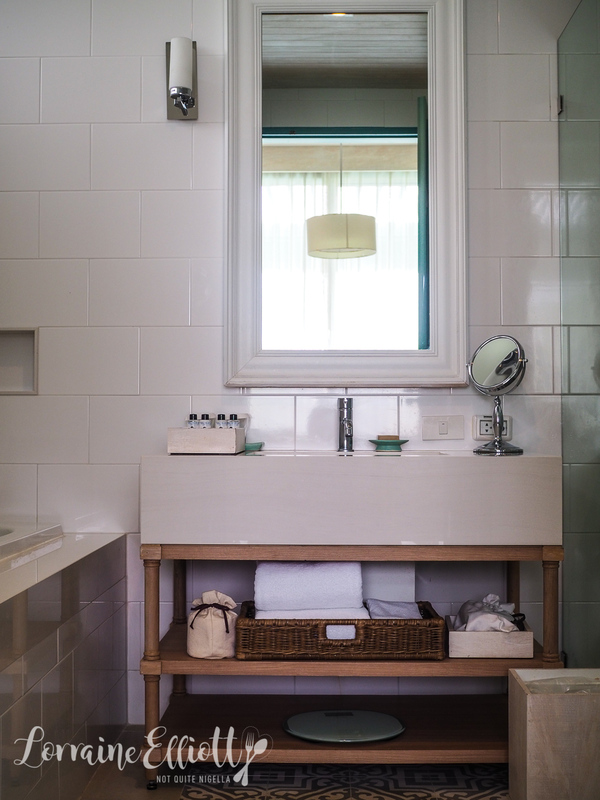 Behind the blue door is the bathroom with tub, separate shower, sink and toiletries by Erb. The tiles feel wonderful underfoot. 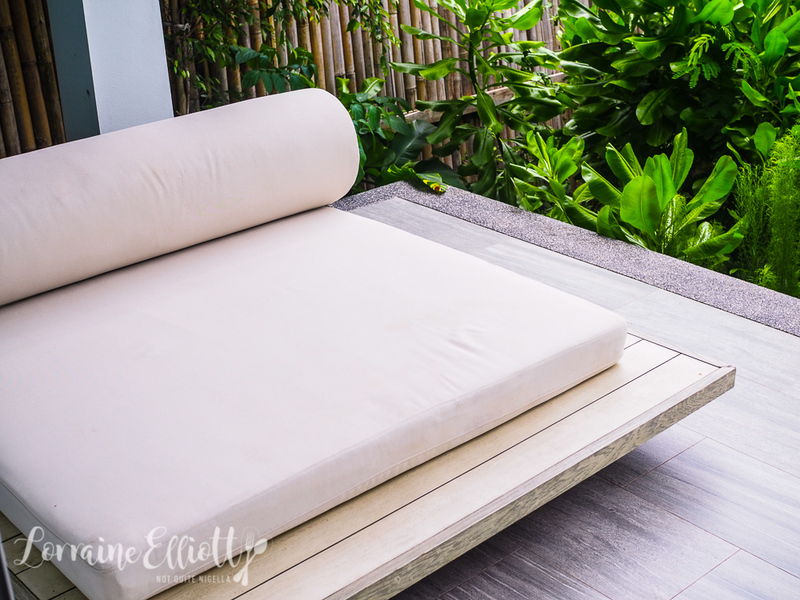 And if you slide open the balcony door you can glide straight into the square plunge pool or take advantage of the sun on the day bed. There is also complimentary wifi. 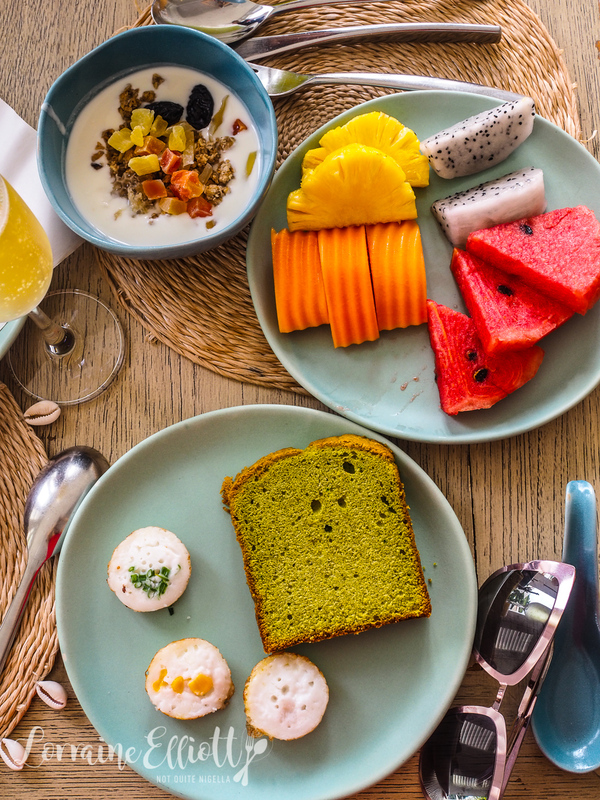 Keen to explore the rest of the resort we head to the cool reading room where there are refreshments, fresh fruit and some of those freshly baked cookies. We play a game of pool and read while everyone else sun bathes. The clock swings around to 4pm and we join everyone near the pool for happy hour cocktails. There's a very good Pina Colada and a "Nanny says No" non alcoholic cocktail strong in maraschino cherry. We take a seat under the rotunda and watch scooters putter past and geckoes climb walls. Nobody, including the lizarding folk seem to be in a hurry. Day turns into night and it's time for dinner. 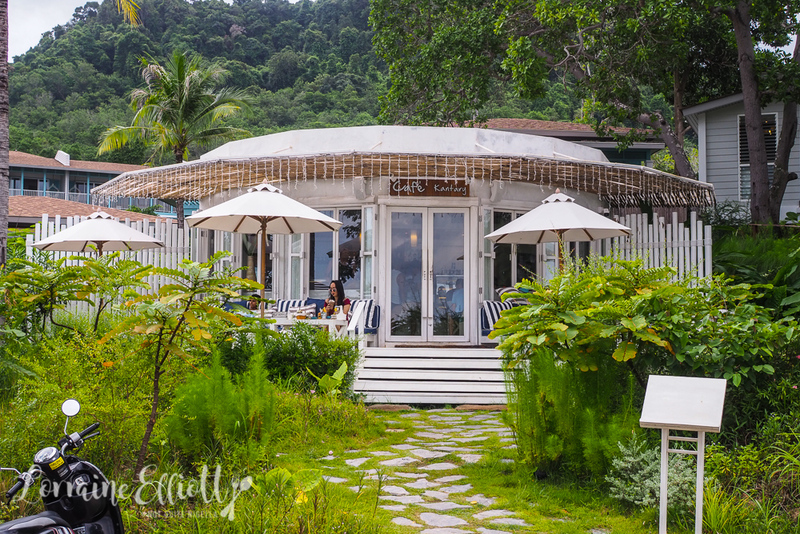 The Hornbill restaurant has both an indoor and outdoor area. 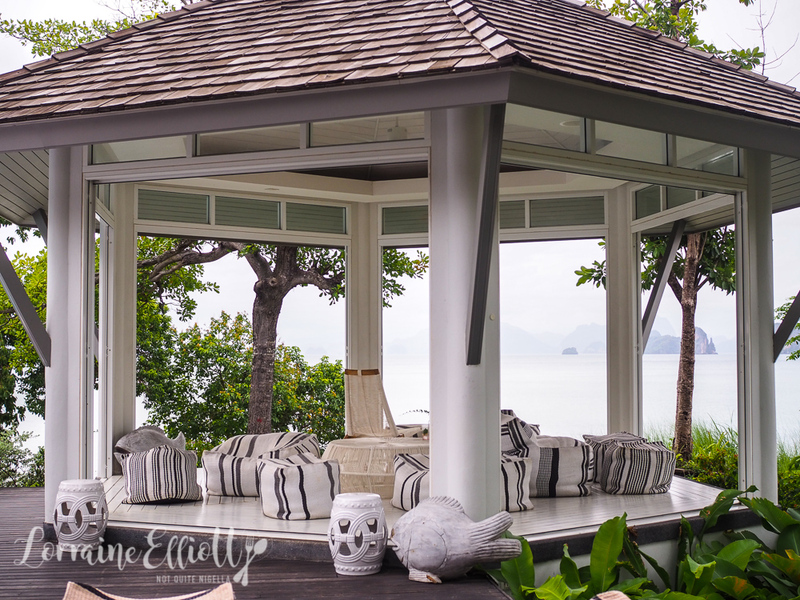 The weather is pleasantly warm but not oppressively so (Koh Yao Noi has an ideal tropical climate that is less humid and hot than the rest of Thailand) and we pick a corner table with large comfortable seats. 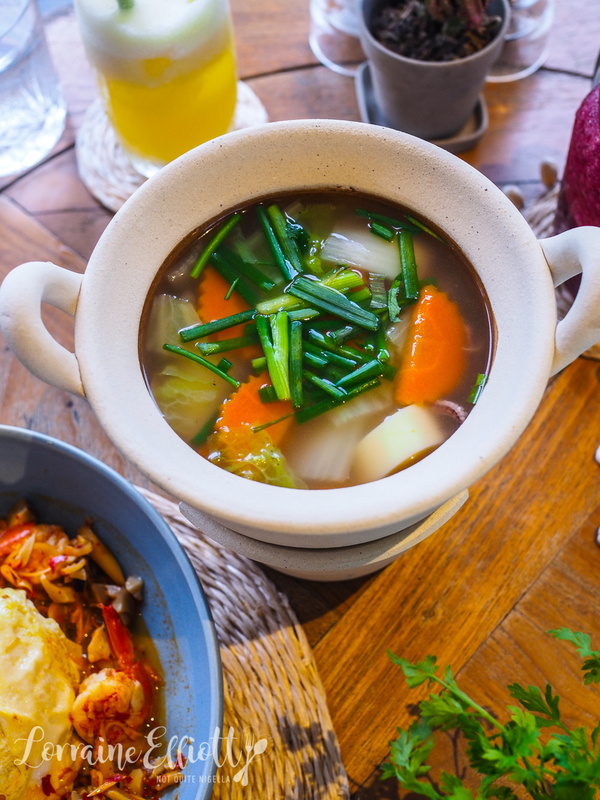 The menu is comprehensive and includes an all day breakfast (those three words fill my heart with joy) as well as Western dishes like grilled steak, cioppino seafood stew and lamb shanks as well as Thai specialties. 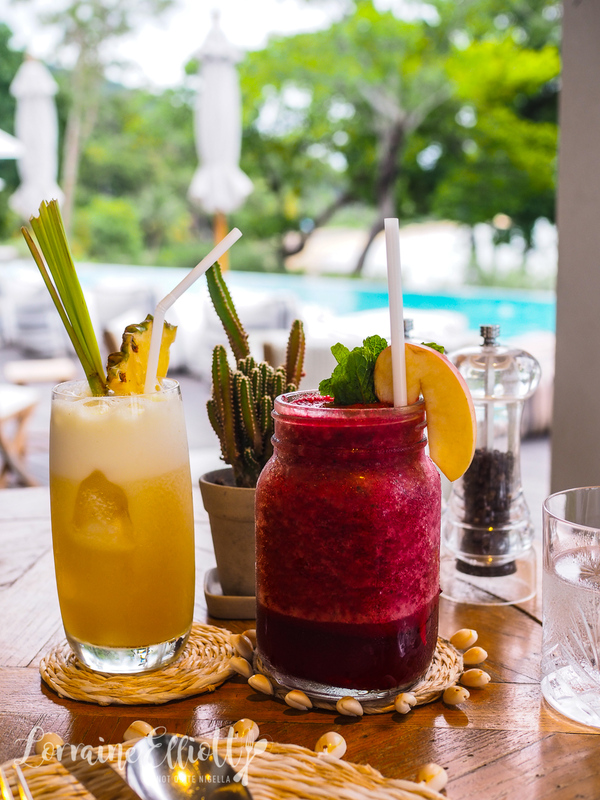 It's also on-trend with fresh juices including a cold pressed pineapple and lemongrass juice as well as beet juice with beetroot, apple, carrot and mint. 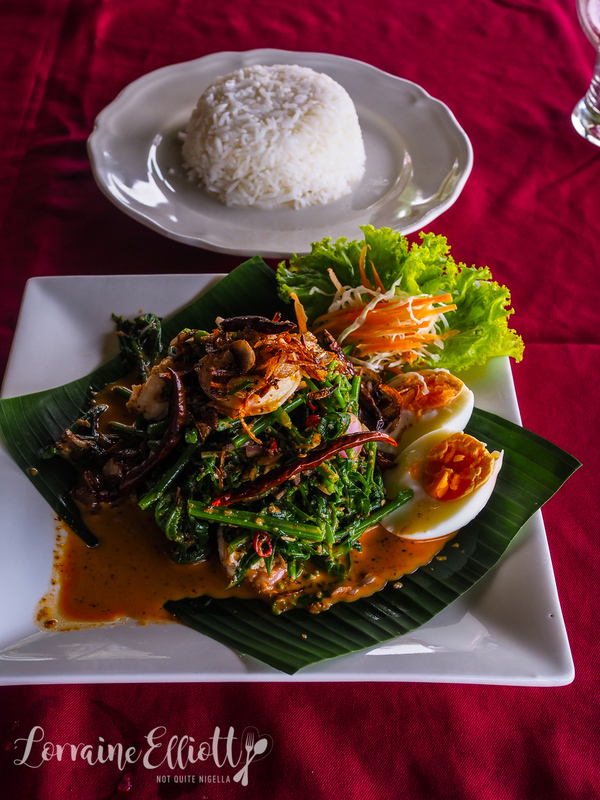 We hone in on the Thai dishes particularly the Southern Thai ones. We also went with a lot of the chef's recommendations as indicated on the menu (spicy, vegan and vegetarian dishes are also marked). There is no pork served at the resort to respect the Muslim population and there is also no foie gras or shark's fins at any Cape and Kantary properties for ethical reasons. 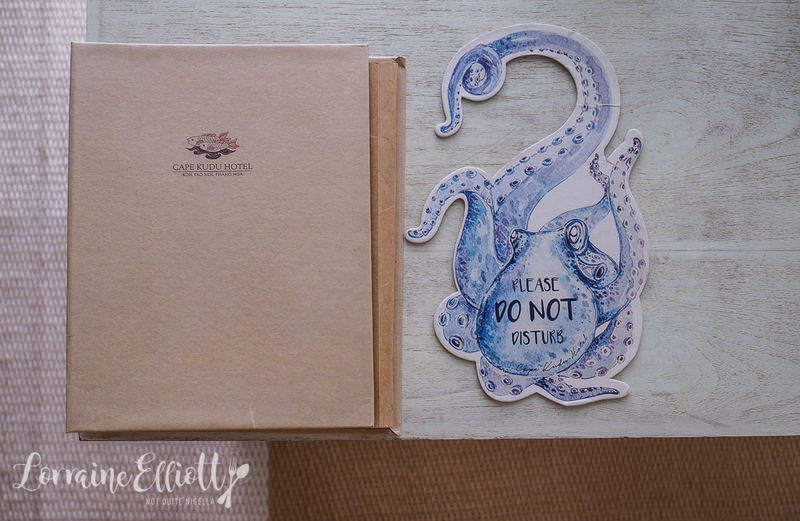 With a name like "Suspiciously Delicious Squid Soup", we were very curious to try the soup. The broth is clear, slightly sweet and served with slices of boudin blanc sausage and a minced chicken stuffed squid and vegetables. It's a mild but comforting soup. The menu has some twists on dishes or modern interpretations. 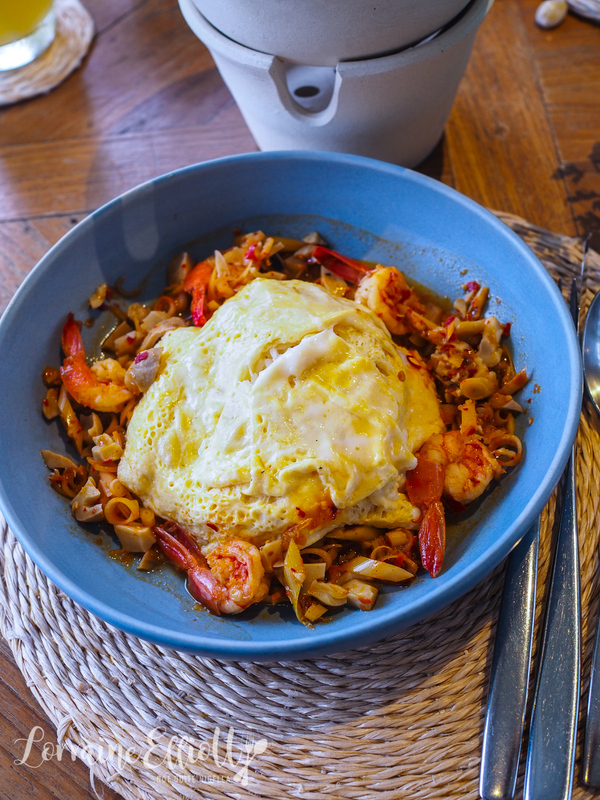 This is a omelette version of tom yum soup with plenty of lemongrass and chilli served over a bed of rice. Over this is an omelette layer. I don't think they quite believed me when I said I liked spicy so I need to order some more chillies. I've had something very similar to this at a Shanghai restaurant but made with chicken and tofu. This is made with chicken and mushrooms. 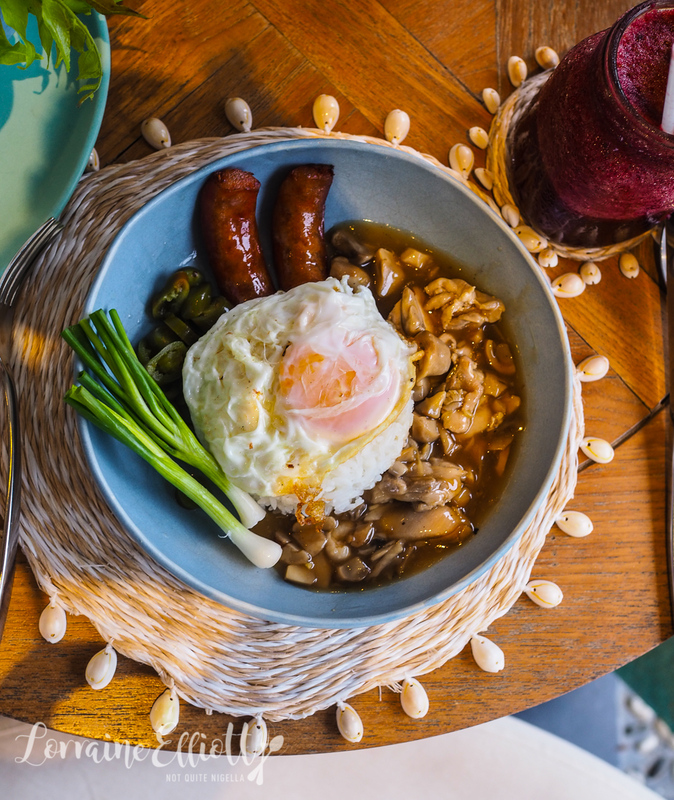 There's a rich, comforting gravy made flavoured with Shaoxing cooking wine and chicken thigh on a bed of jasmine rice with a fantastic chicken chorizo sausage, a sunny side up egg and pickled jalapenos. Heaven. I actually ordered a side of sticky rice and I really enjoyed the sticky rice with the sausage. Southern crab curry is fast becoming my favourite Thai curry. 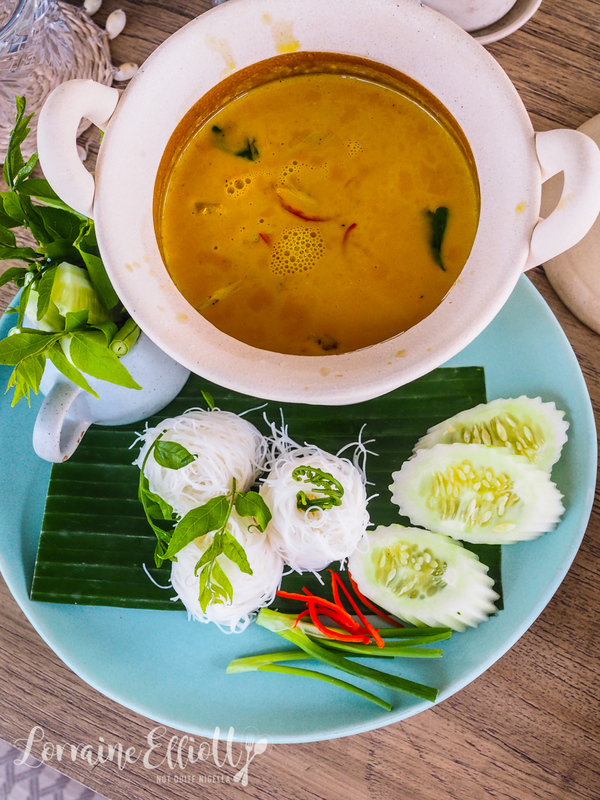 The crab is already shelled for those who don't like dealing with cracking crabs and comes with flavours like kaffir lime leaves with a plate of fine vermicelli noodles that you dip in the curry sauce. 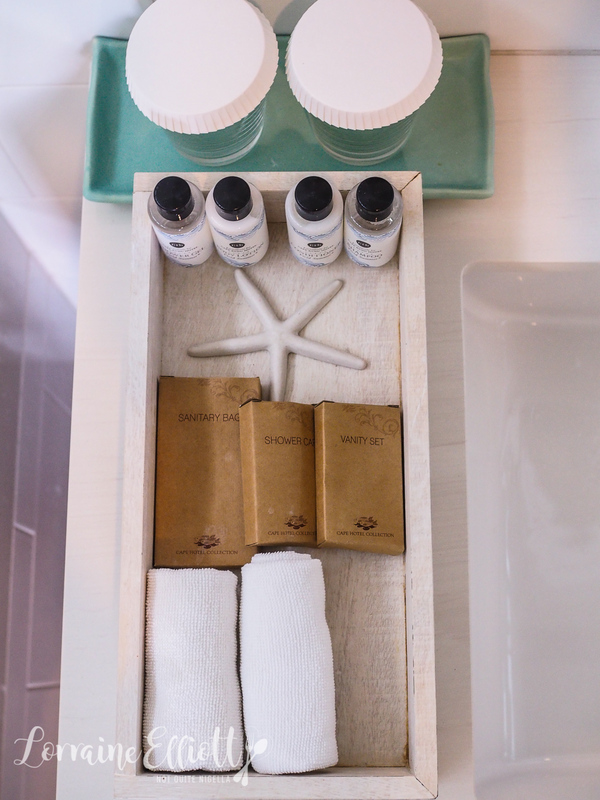 And when we go back to our room, turndown has been performed and there are delicious chocolate coated macadamias on our pillows as a welcome amenity. A long soak and catching up on the book is all there is on the agenda tonight. 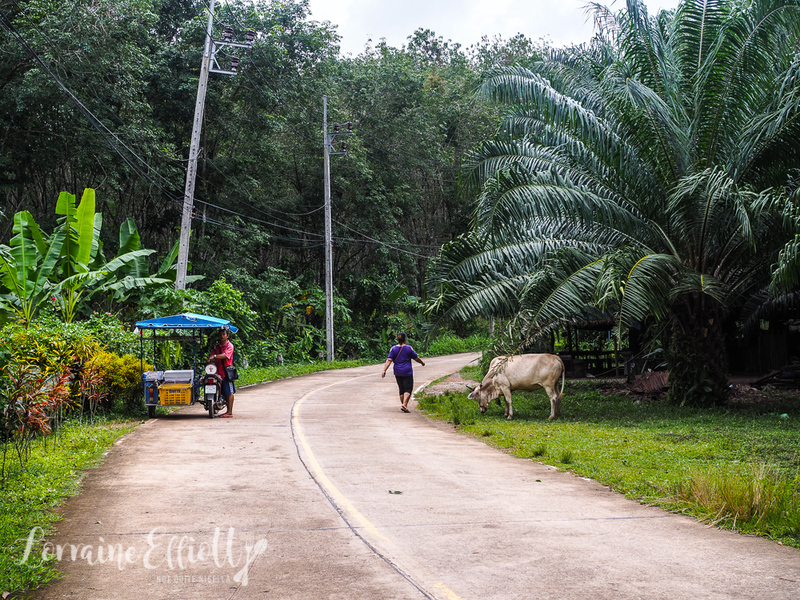 The next day is spent exploring Koh Yao Noi by scooter but before we do that, we make our way to the Hornbill restaurant for breakfast. There is an a la carte menu selection which is extra but the included buffet is plentiful and tempting so we go for that. There's a fresh fruit cart with a good selection of fruit. 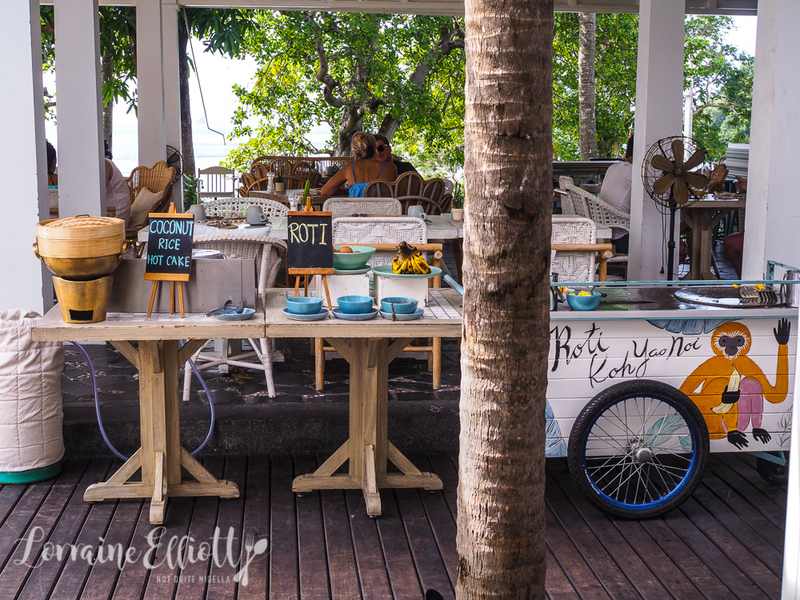 There is also a roti cart making fresh banana, egg or Nutella roti. We take a seat inside and there's a range of pastries and breads including fat pretzels and danishes. There's a continental selection of cheeses and meats as well as an egg station making omelettes, French toast, waffles and pancakes. There is beef bacon, beef sausages, stir fries, curry and congee as well. I ask for a crispy roti topped with sugar and condensed milk. 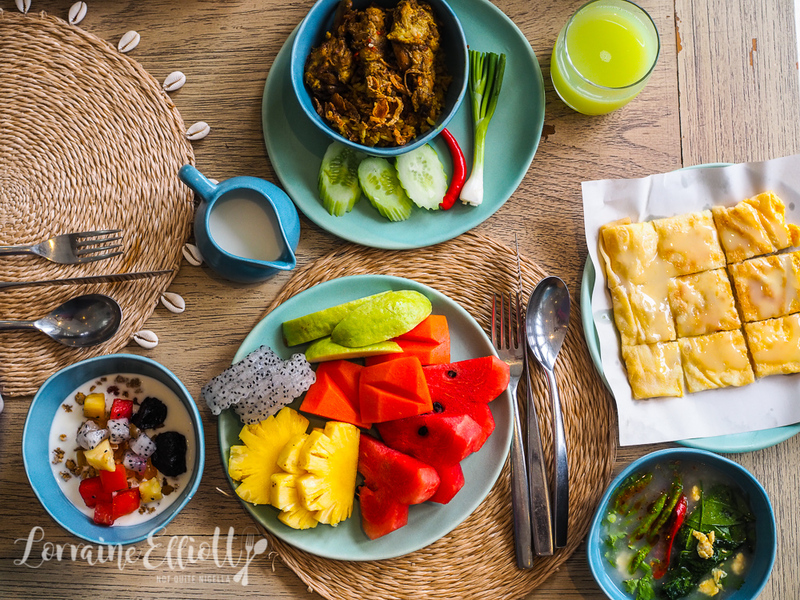 Every day the selection changes slightly-one day it may include crispy coconut cakes, the next "wild eggs" with chilli in a banana leaf, sticky rice desserts and Kanom jeen soup noodles. 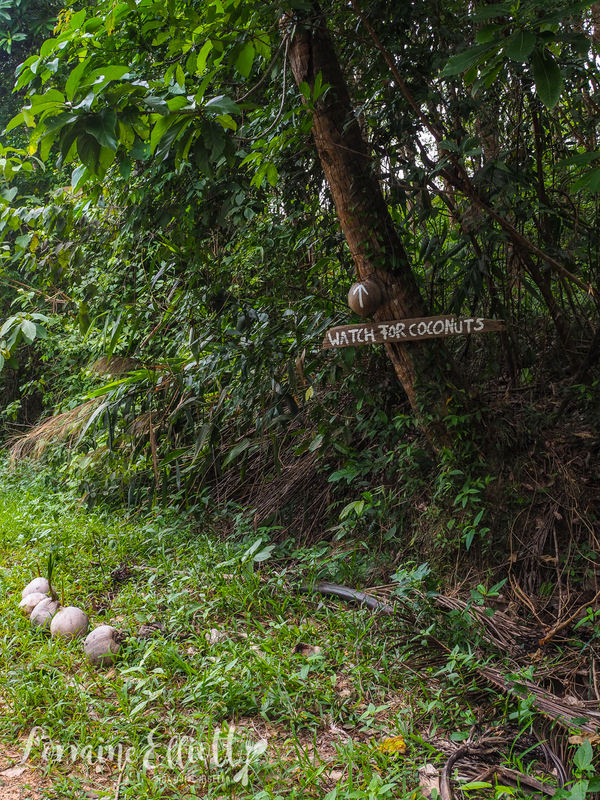 One of my favourite drinks is the smoked coconut which is an intensely naturally sweet coconut water. Every morning I would spring out of bed, do a workout and wander down to breakfast like a hungry bear. There is also a hot Thai selection on a separate table that changes daily. 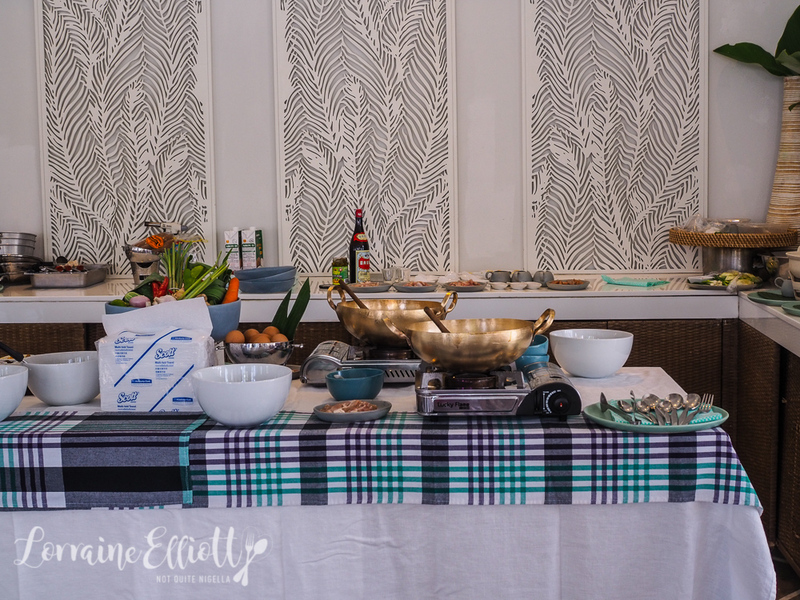 It's also my favourite stop at the breakfast buffet-one day it is the Muslim yellow rice curry which I absolutely adore (recipe coming up for this!) and the next it is fried chicken with sticky rice. 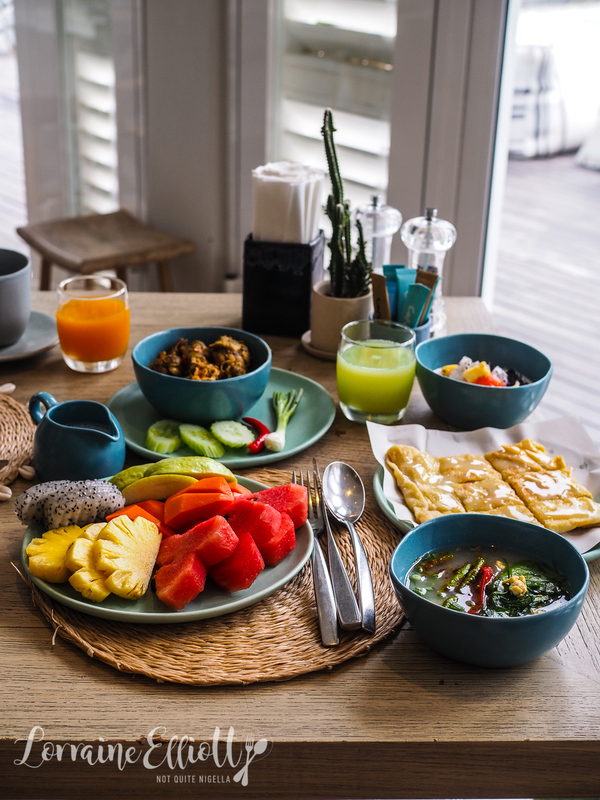 It's all we need to set us up for a day of exploring and because breakfast finishes at 11am we find that we are happy eating this and then eating dinner at the end of the day bypassing lunch if we were too busy exploring the island. 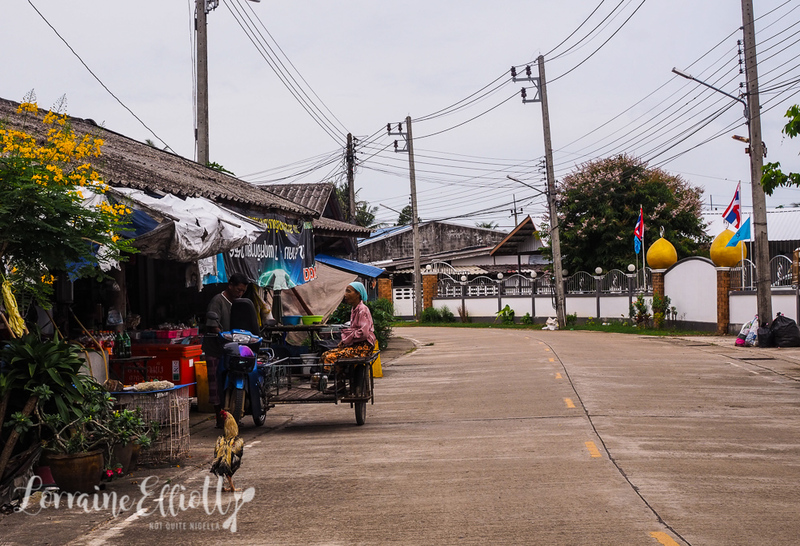 While getting around in Phuket is not that easy and expensive, getting around KNY is easy by scooter or bike. No license is needed to rent a scooter and there is a vendor literally right outside the hotel that rents scooters for 300THB per 24 hours. 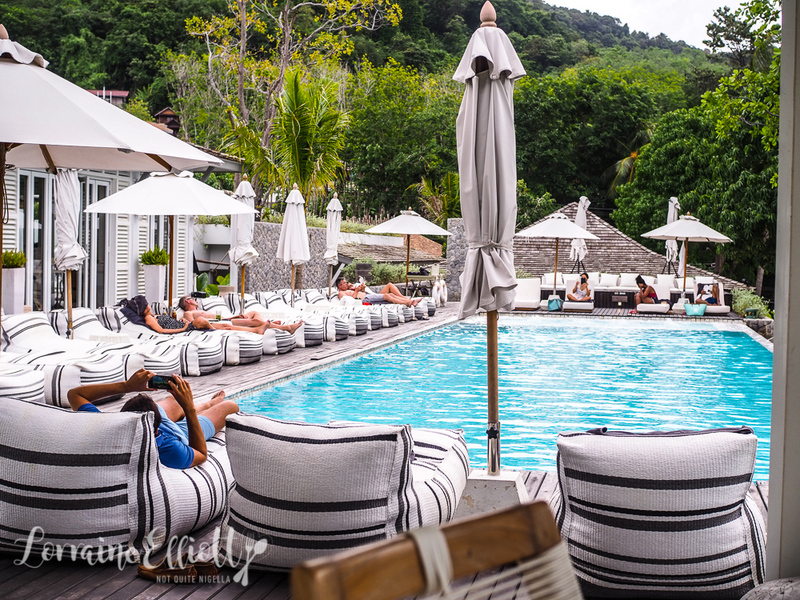 We get the low down on the best hidden gems from Olivier the guest relations manager and all round wizard who makes things happen. He gives us great tips for things that you can't find on tripadvisor with a real local focus. 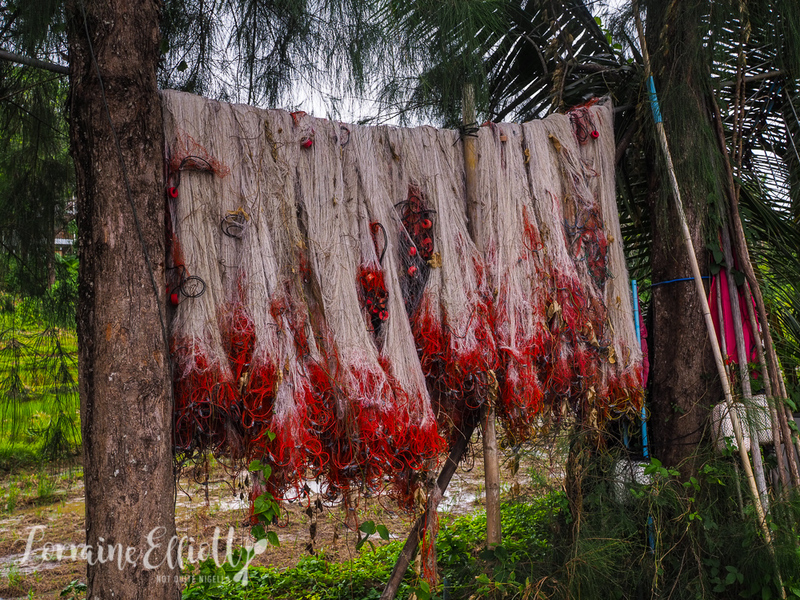 We discover wonderful local cafes, delicious roti, incredible seafood restaurants, look out points, and the island's best food (I'll share these in a separate post). We return each day in a buoyant mood after a full day exploring. 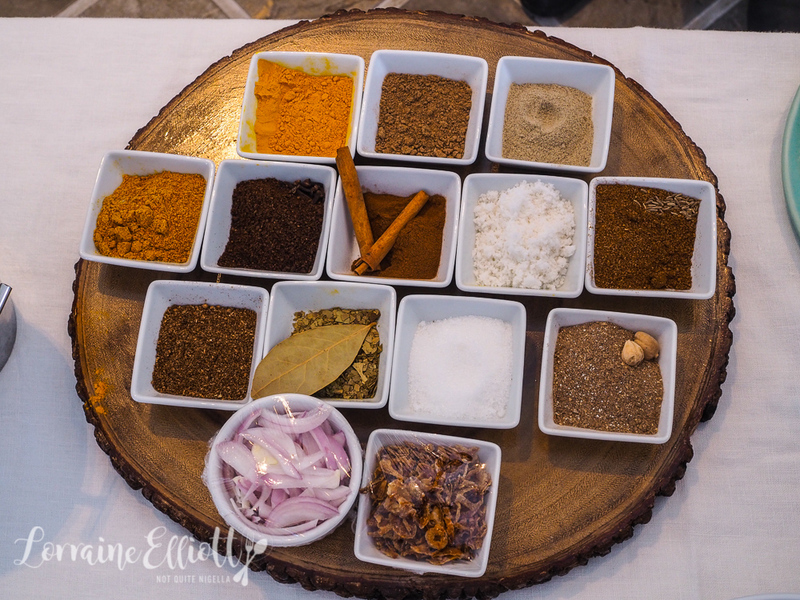 One of the in-house activities I enjoyed the most was the Cape Kudu Thai cooking class. 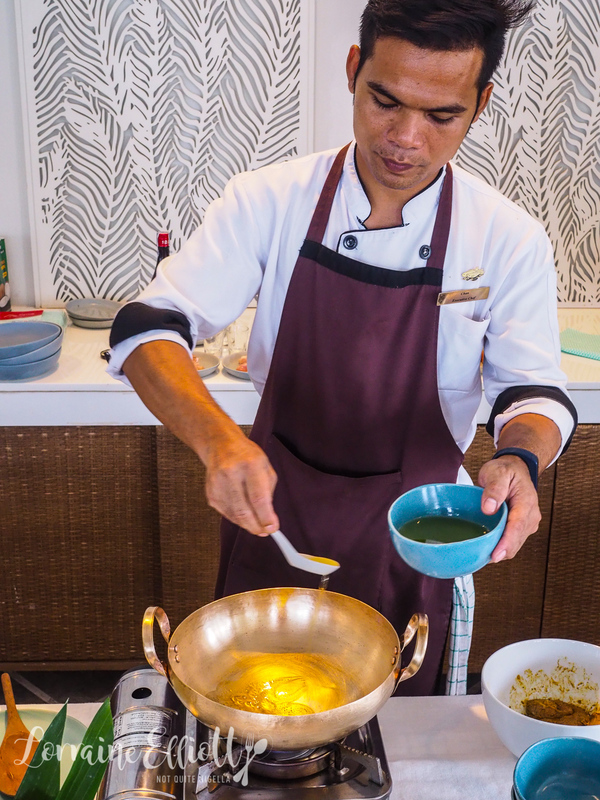 There are plenty of Thai cooking classes but all of these classes tend to offer similar dishes like green curry and tom yum goong which are delicious but I wanted to learn a bit more about Southern Thai and Muslim cuisine. And when I mention that I'd love to learn how to make that Muslim yellow rice and chicken and the chicken with gravy sauce and the Southern crab curry to Olivier he says that they can show me how to make those which makes me ridiculously happy. We have the cooking class in the Hornbill restaurant where they have set up three stations: one for chef Chan and one for me and one for Mr NQN while front of house staff Annie interprets. There are traditional golden pots called Thong Leang or the ancient version of a wok. These pots are interesting to cook with as they heat up very quickly but also lose heat very quickly. We start with spicing the chicken which is best left marinating in the spices for 2 hours. We mix it with yogurt and butter and you can use chicken on the bone or off-we are using chicken thighs. We also spice the rice, add it to a rice cooker with chicken stock and the chicken on top and leave this to cook. 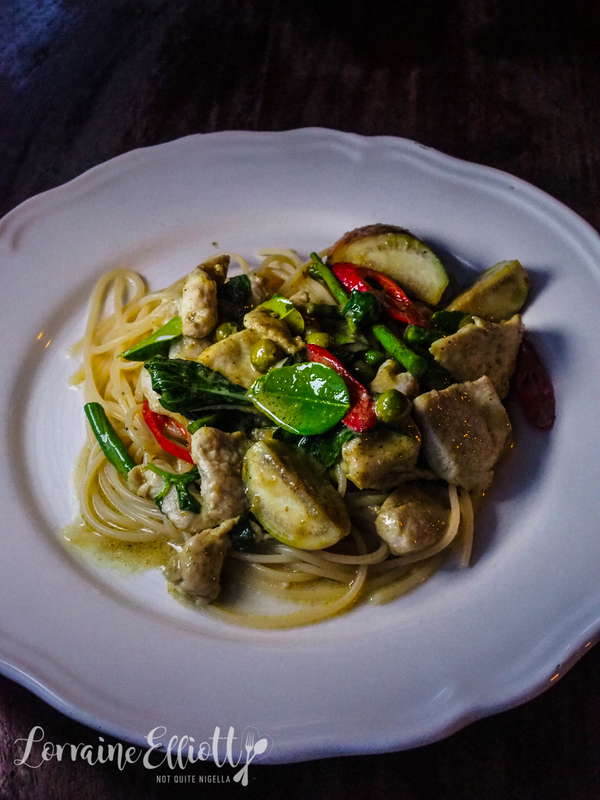 Then we move onto the chicken with gravy sauce, a Thai Chinese dish that is so simple but wonderfully comforting. They serve this with a chicken chorizo sausage that tastes like lup cheong except isn't made using pork. This comes together very easily too with just a few ingredients. And lastly we make the southern crab curry with a rich curry sauce. You can also use prawns or fish or any other meat in place of crab. They serve this with rice vermicelli noodles instead of rice and it is served in a clay pot called a mor din that sits above a tea light. There's an abundance of food but it's so good that we can't stop eating it. Another day we spend exploring around the island and watching day to day life. We watch as a man carries his bird in a cage while we watch another gentleman grooming himself on the side of the road in his scooter mirror. Families look on as the father brings in a catch of the day's fish - most of the industry on KYN is based around the sea with many fishermen. A group of four boys wave eagerly as they go off in search for new adventures. 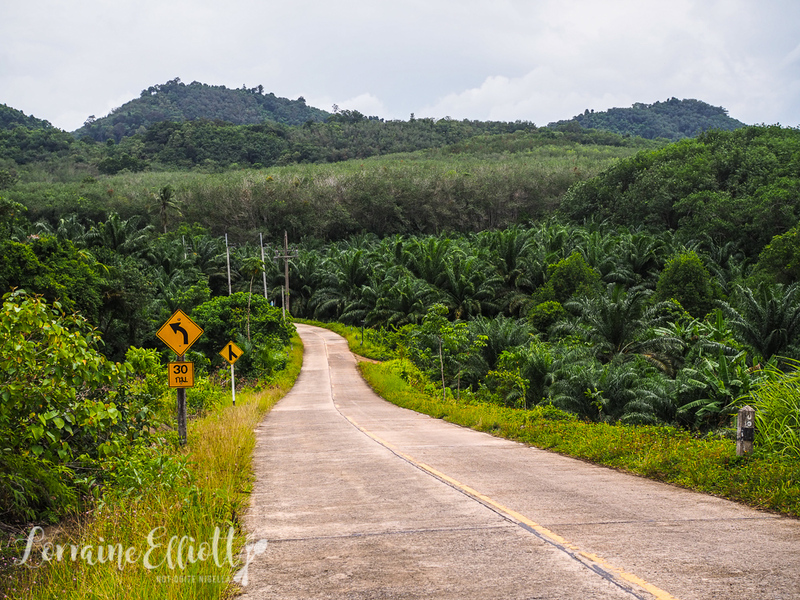 There's one area of the island that we haven't explored so we go off in search of it and follow a sign up a steep hill to the Hideout hotel where we stop for a look at a view, a lie back on the hammock and a drink. There are more stops to run errands and get ready for our impending trip home. I have a massage and then it's time for a late lunch. The fulsome breakfasts mean that we aren't even hungry until 3 or 4pm. 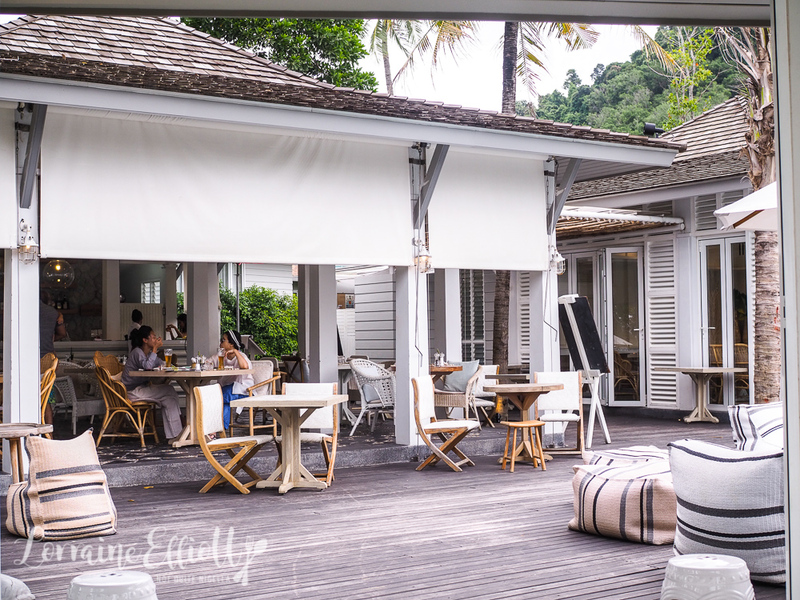 We make our way to Cafe Kantary, Cape Kudu's photogenic cafe and popular spot for photos and selfies. The decor is all whites and blues and it is a self service cafe with plenty of cakes, breakfast and lunch as well as pizza and burgers. I order a matcha red bean cream drink as well as a Mocha Chocachip frappe topped with cream and an Oreo. You wait at the counter for the drinks but they will bring the food to you. There are three indoor tables but plenty of outdoor ones which are the pick. 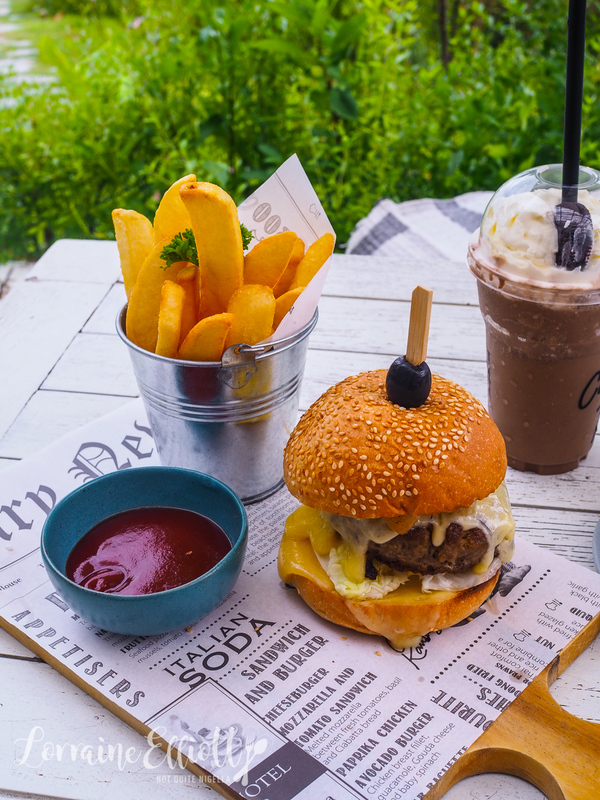 The mac and cheese burger comes with a thick beef patty, slices of white onion, lettuce, tomato, melted cheese and mac and cheese. I spread some tomato sauce on it. It also comes with a generous side of fries. The Kaikrata is a smoked salmon omelette served in the pan it is cooked in. There's also chicken ham, croutons, salmon roe, kaiware srpouts and mozzarella and is strong in salmon flavour. And then there's dessert-the bannoffee pie is a tower of banana and a chocolate topped biscuit base with cream. They use fresh cream but they treat it so that it has a bit more staying power in the heat. I would have loved a bit more caramel in this. 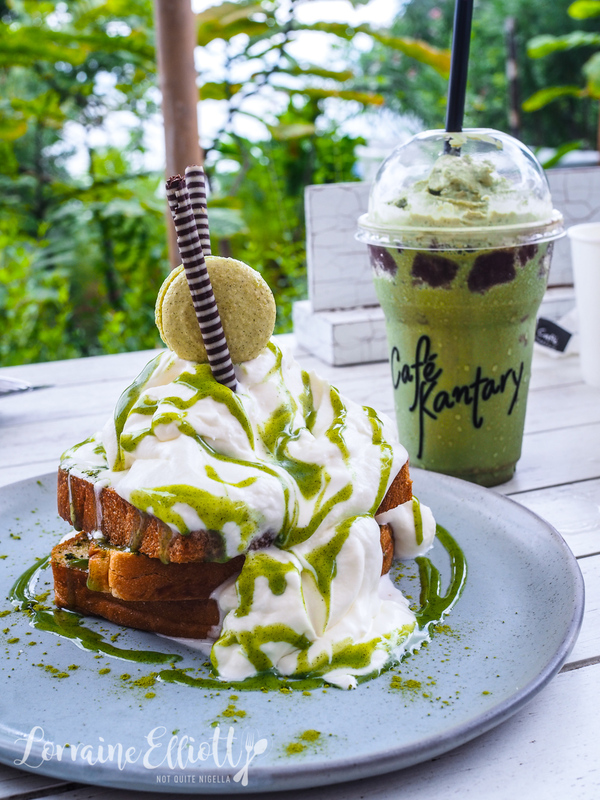 But the item I had been looking at every day when I got my matcha latte is the matcha toast with lashings of white chocolate sauce, cream and ice cream as well as matcha syrup. There are three slices of toast each buttered with a slightly sweet matcha butter. And to top it off, some chocolate sticks and a matcha macaron! The whole time I had been here we were so busy. So much for the do nothing holiday but we loved the freedom of being able to easily explore things ourselves and looked forward to an adventure every day. 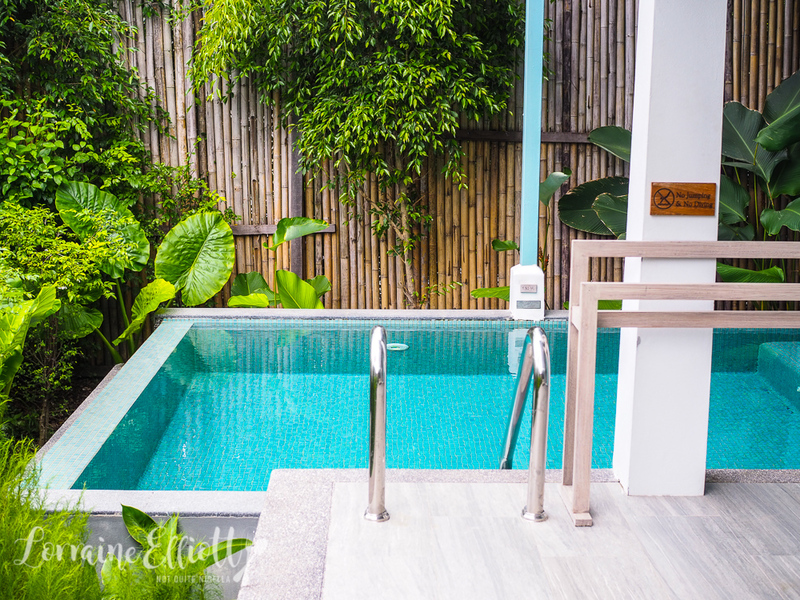 But it soon came to the last full day here and I realised that I hadn't even been in the plunge pool yet! We go for our final dinner at a local restaurant called Kaya which is a 10 minute scooter ride away. The all female team that run Kaya are so welcoming and sweet that we realise that we are going to miss the island a lot when we have to leave in the morning. 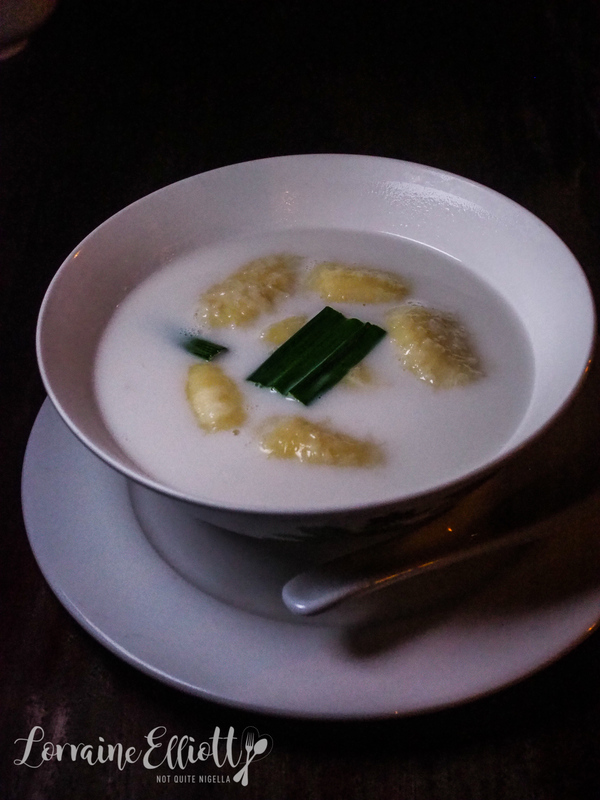 We feast on massaman beef curry, sticky rice and green curry and follow it with banana simmered in coconut milk. They wave us goodbye while genuine smiles. 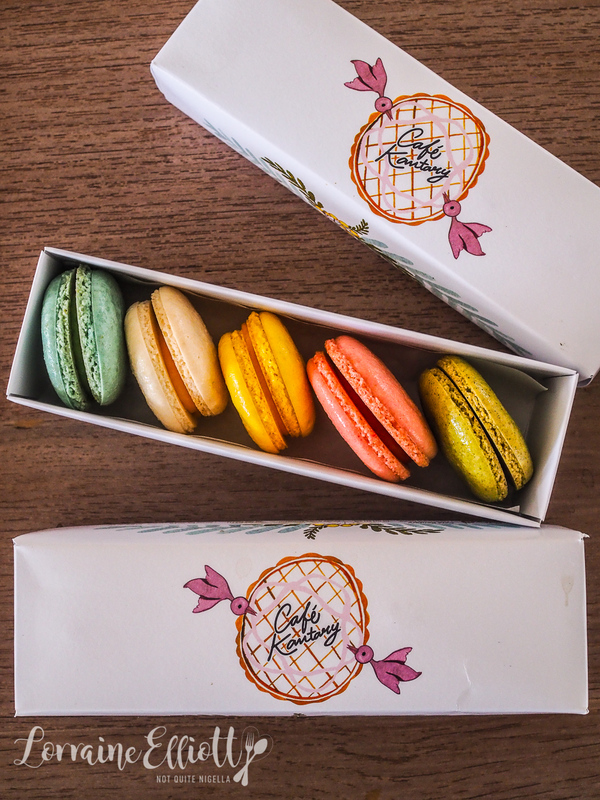 The next morning as we check out we are given a parting gift-a box of macarons from Cafe Kantary. It's with a sense of sadness that we have to leave (although this is coupled by the fact that I know that I will return). The staff and locals are so friendly and their smiles aren't predicated on a potential purchase. As I get off the speedboat to be whizzed off to Phuket airport, a local woman sees my hesitation at walking across the other boats and gently takes my hand and guides me across with a kind smile before waving me goodbye. So tell me Dear Reader, which country or place do you think has the friendliest people? 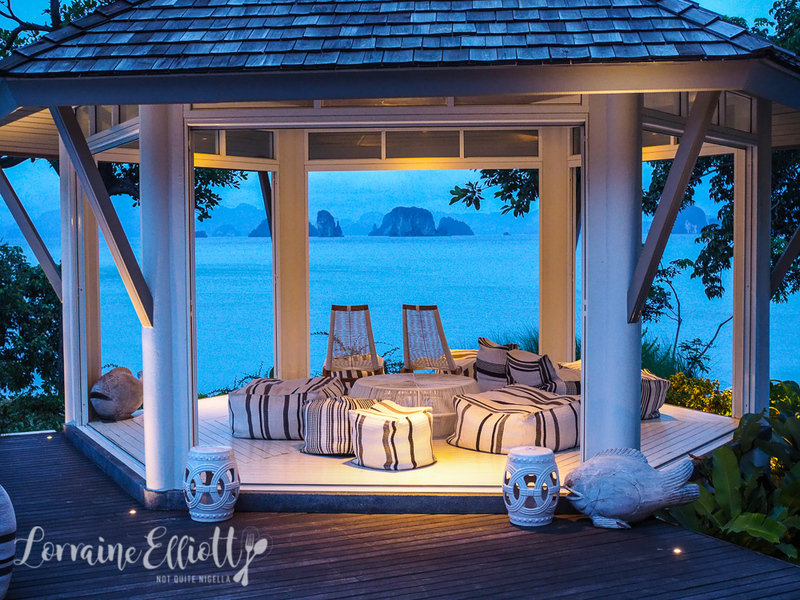 Have you ever heard of Koh Yao Noi? 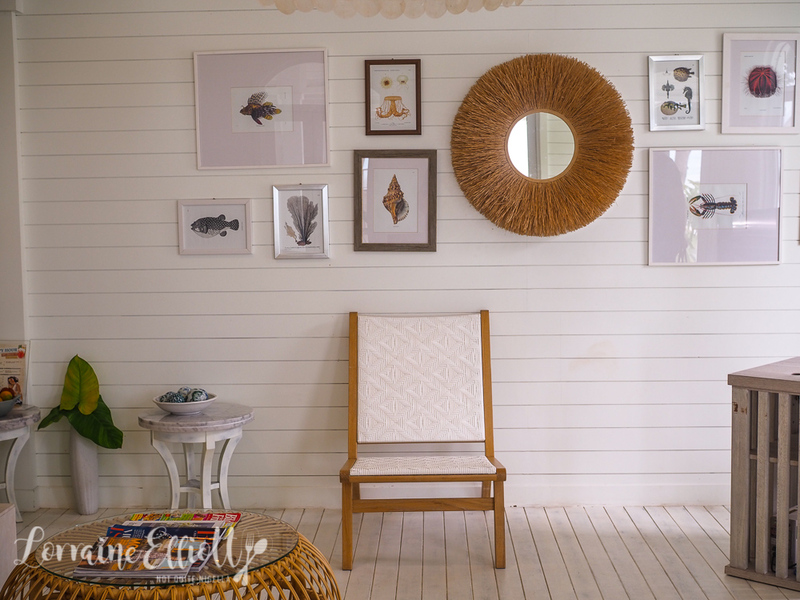 Do you prefer relaxing or exploring holidays? NQN and Mr NQN stayed as guests of Cape Kudu but all opinions remain her own. 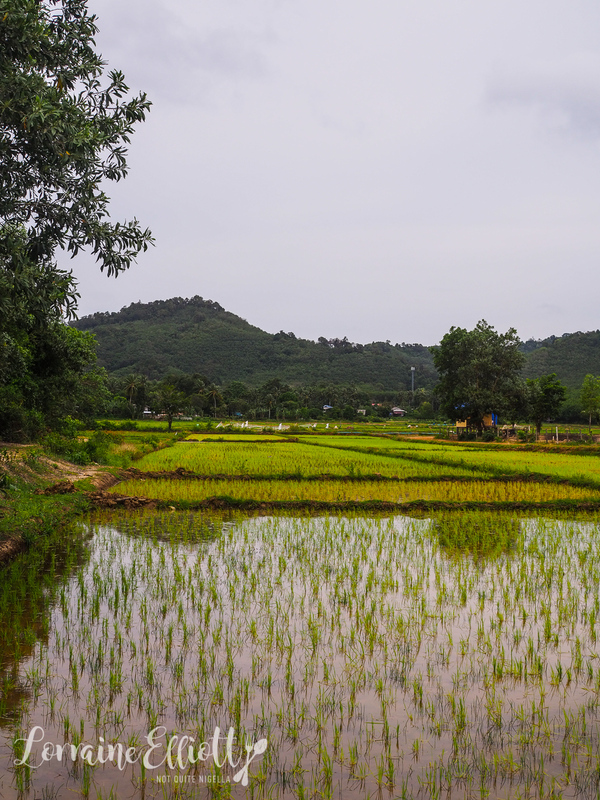 travel5 Fantastic Chiang Mai Food Experiences & Handy Tips for Chiang Mai! 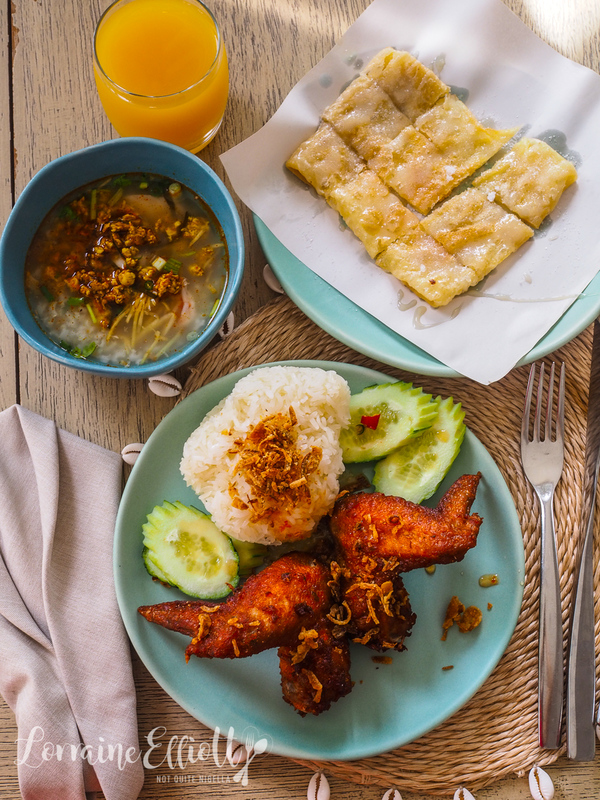 travel11 Delicious Local Phuket Foods You Have To Try! 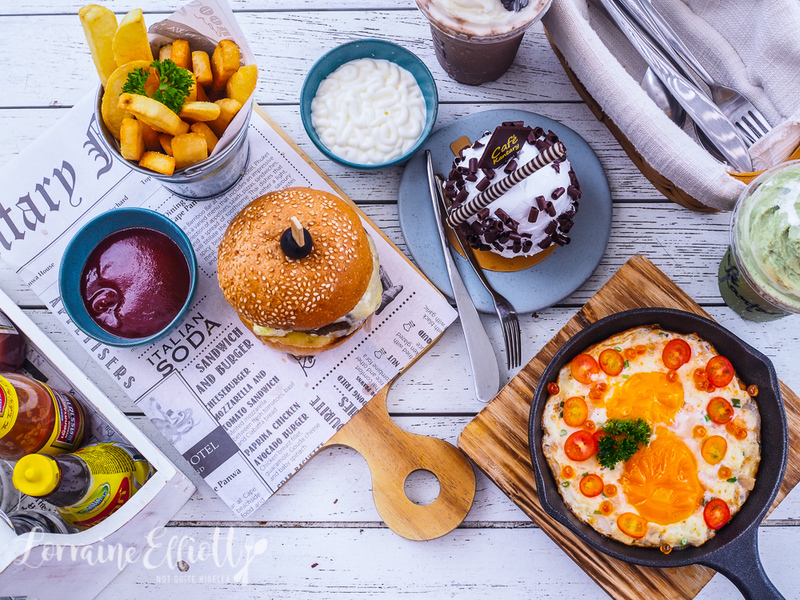 travelSix of the Best: Bangkok Restaurants! 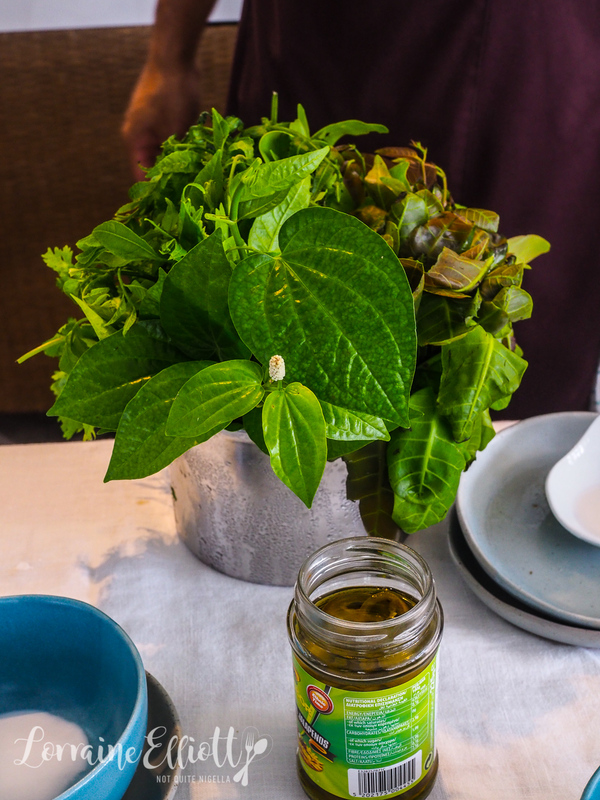 travel 5 Fantastic Chiang Mai Food Experiences & Handy Tips for Chiang Mai! 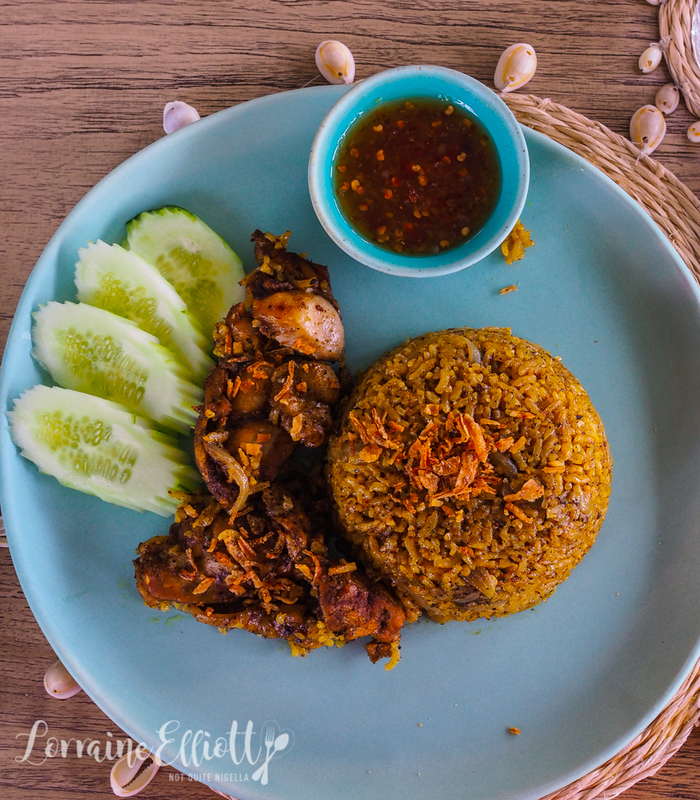 travel 11 Delicious Local Phuket Foods You Have To Try! 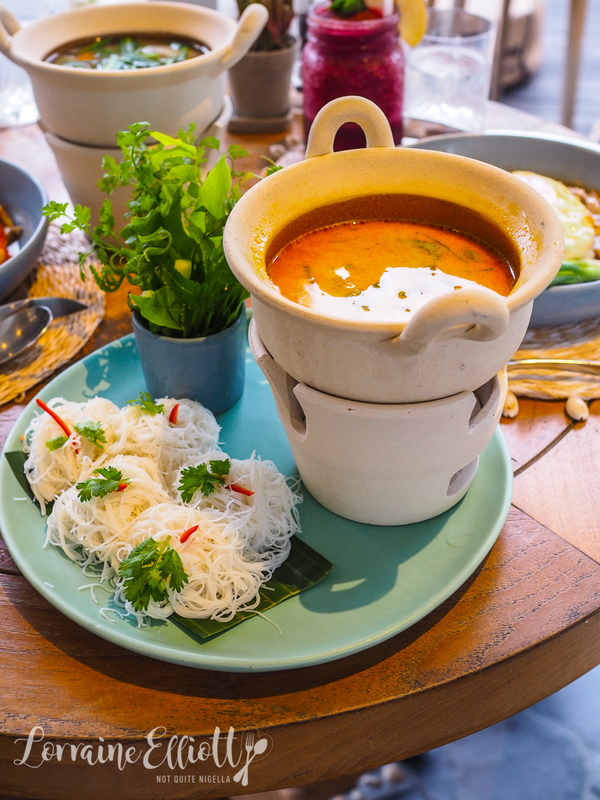 travel Six of the Best: Bangkok Restaurants!